Formerly, any car key issue would have to be dealt with by your official dealership. Firstly there's the question of getting your car to one, and secondly, there's the enormous cost and the wait of getting your problem solved and any new keys delivered. Now, we can avoid any of that stress, cost and hassle by providing a full auto locksmith service at the road-side. We can circumvent the cost of new locks by using up-to-date extraction and repair techniques, cut and program new keys and transponders and provide replacement and duplicate keys that can be tested in front of you. Replacing car keys is far simpler than ever before. The difficulty was, that every modern car is fitted with an immobiliser, which is a complex security system preventing your car from being turned on without your specific key being matched to your specific car. Replacing car keys was usually only possible through official dealerships, which are pricey and often take a long time to deal with the issue and send out any replacements from their manufacturers. We can carry out the same service, on the day that you call, at your location! Breaking keys isn't easy and fortunately, it doesn't happen often. If it does though, the consequences can be catastrophic, especially if you're distanced from a dealership, it's late at night or you can't even access your car's interior. Our locksmiths are on call 24/7, to deal with any broken key issue with your car. We are adept at extracting car keys without damaging your lock or key beyond what is necessary, circumventing the cost for new locks. We can often unjam locks easily and quickly enable you access to your car. Losing any key is a hassle, but don't panic if you do lose your car key or are unfortunate enough to have it stolen. Even if you don't have a key to cut a replacement from, we can access our existing databases and generate new, unique keys for your car that can be cut and programmed at your location. We can access your car's immobiliser system in order to edit or delete old keys for lost or stolen keys. This means that anyone who comes into possession of your old key can't access your car. We can perform these tasks at the roadside and test newly generated and cut keys in front of you. Key fobs or transponders are vital gadgets for car security. They're advanced bits of kit and you need advanced equipment in order to diagnose, edit or repair them. We have the know-how and necessary tools to do so, with the ability to access your vehicle's computer system to edit your key database. We can diagnose problems with transponders and fix them at the road-side. Dealing with transponders is no longer reserved for dealerships. We provide a quicker, cheaper and better service. Auto Locksmith London is a company that is very dedicated to giving the best locksmith services throughout the city of London and the surrounding regions. We have a long list of loyal customers due to the high quality of services that we give to all our customers. We have skilled locksmiths who make sure that they do not leave you with a car locksmith problem that has not yet been addressed. In addition to the skills that they have, these people all have clean background that have no criminal records hence you can be sure that they would never do anything that will compromise your security in any way. We offer a wide range of automotive locksmith services hence you can be sure that you will never come to us and leave disappointed after failing to get the services that you require. On top of that, we make sure that all these services are given with the highest possible level of service delivery so that none of our customers leaves us with any trace of disappointment after receiving sub-standard services. Our services cut across the car locksmith industry from lock repairs to key replacement and repairs hence you need to rest assured that we will have a solution ready for you in no time after you call us. We have mobile car locksmiths who serve the whole of London and even some of the surrounding towns hence you need not worry about looking for a tow truck to get you to our garage whenever you have a locksmith problem. The moment you call us with a car locksmith problem, we try as much as possible to ensure that one of our locksmiths is there with you in less than 30 minutes. However, this depends on the place from which you are calling us from. Nonetheless, we have the fastest response rates when compared to all the other locksmith companies in the region hence you can be sure that when you call us you will have someone working on your vehicle within the shortest time possible. Our services are available for 24 hours every day, 7 days a week. This is to mean that you will not be forced to leave your car by the roadside or in a hotel parking lot to wait for working hours due to a locksmith problem. Not unless you have not heard of London Auto Locksmith. Our mobile locksmiths come fully equipped to get you out of your situation irrespective of the magnitude of your problem. If you have been locked out of your car, they will perform a car entry that will leave your car intact without even a single scratch. If need be, they will make for you a key replacement that will provide you with a key that will work just like the original key. Modern cars are required to be manufactured with immobilisers and transponders. In combination, these made car locks difficult to edit, repair and their problems hard to diagnose. Nowadays, with the latest mobile technology, we can diagnose almost any error for any car make at the roadside or at your location. Before now, you'd have to travel to a dealership or consult a mechanic about a lock issue. Dealerships are very pricey and often can't deal with the problem immediately and then there's the obvious question of getting your car to one when you can't access or drive it! Mechanics aren't always trained locksmiths and often aren't equipped with the necessary technology to deal with car lock and key issues. Often, replacement lock systems are offered that cost large amounts, when the issues themselves are easy to solve with the right knowledge and technologies. This is why a specialist car locksmith service such as ourselves are invariably the best option for car lock issues. Replacing car keys isn't as simple as replacing house keys. You need to match transponder data between your key and your car. These electronic gadgets make replacements hard to get hold of. Before services like our own, the only option for gaining replacement car keys would be through your car's official dealership. You'd normally have to apply for a new key and it'd take a week or more to arrive. That's no good if you need a key quickly, perhaps for family members or to replace lost spares. 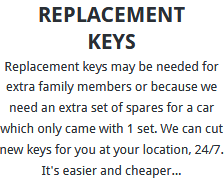 We can cut replacement keys at your location, using mobile technology. The differences are massive – it's quicker, cheaper and easier and we can demonstrate that your key works there and then. 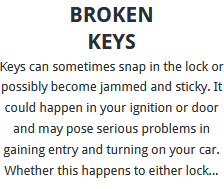 Keys aren't generally easy to break but it can happen. Sometimes they snap in the lock or the locks themselves become jammed. Extracting old keys is a job for a locksmith and our technicians cover the task, guaranteeing that they'll use non-destructive techniques if they can, to minimise or eliminate any damage to your lock. Compared to mechanics, who often opt to replace the lock, this is cheaper and more effective. Often we can rebuild parts of broken locks without replacing the entire thing, too. 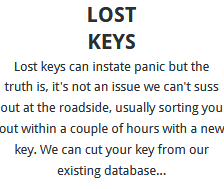 If you lose your key or it's stolen, we can replace it with the benefit of our massive database of existing cuts and information. We can cut unique keys using this existing data and program them digitally to your vehicle. We can enter your car's immobiliser system and delete any old key data for keys that are lost or stolen. This guarantees your car's safety from those who may possess your old key. 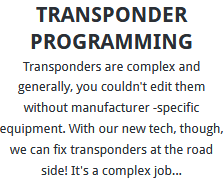 Transponders are your beepers, zappers or fobs, or any other name you might call them! They match the key's code to your car's code, enabling the ignition to be turned on and the car to be driven. We can edit data in these keys using our new-gen technology. This means we can add new keys to your car's immobiliser system at the roadside and alter it to accept your new cut. When it comes to transponder chip keys, we are the people to come to. Don't ever wait for weeks or pay exorbitant prices for your car dealer to make for you a new set of keys for your car. With London Auto Locksmiths, everything is done by the roadside or in the same parking lot where the problem found you. This eliminates the need to tow your car to anybody's workshop just to have a key replaced. We also perform key duplication for all types of car keys throughout London. Don't wait until you find yourself in an emergency. Make a spare set of keys that will keep you on the safe side in the event of losing or misplacing your original set of keys. This spare set of keys also comes in very handy when your original car key gets broken or worn out due to prolonged usage. Unlike most automotive locksmiths in the area who will send you to your car dealer if you have vehicles that use transponder chip keys, we have made efforts to avail a solution for you. We have all the necessary equipment and skills to reprogram the new key so that it can work with your vehicle's immobilizer. If you fear that your keys have been stolen, then we will even re-code your vehicle's immobilizer and make a new key for it. This way, auto locksmith London will allow the stolen key will be rendered useless hence you will have no reason to be worried about someone coming for your car. We always have someone waiting on the phone to respond to any issues that you could be having. These people are very experienced in the field hence they will be able to advice you when you need advice about the service to pick. They will also be in a position to give you a quote after you give them your requirements. Auto Locksmith London is a locksmith company based in London that is devoted to providing effective locksmith solutions to motorists in London. We specialize in solving all locksmith problems from faulty locks to broken keys throughout London. We take a lot of pride in the fact that we have the fastest response rates in the whole of London hence you can be sure that you will never be forced to stay in a tricky situation for long. We have highly trained locksmiths who are always ready to come to your rescue in whichever part of London that you may be in. They come fully equipped with all the necessary tools and equipment to give you any locksmith service that you may require. Contact us and you can be sure that you will have nothing to regret. Other services that we give in London include car key duplication, lock replacement, ignition repair, transponder-chip key programming and even key replacement among others. With our services, you will never need to have your car towed to your car dealer just to have a key replaced. Be on the safe side by having our number on your phonebook so that you can be sure that you will have access to our services whenever you require them. Our services are available around the clock on every day of the week irrespective of whether it is a weekend or a public holiday hence you can rest assured that we will be there for you whenever you need us. All Rights Reserved © 2018 Auto Locksmith London.